But more about this philosopher later. 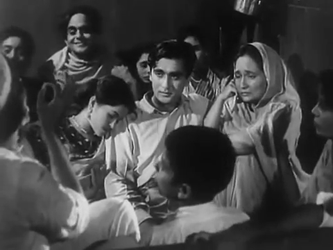 Right now, in the train, some of the people sitting around are appreciative of the man’s singing, but 22-year old Ram (Sunil Dutt, in his debut role), travelling with his widowed mother (Leela Misra) and his sister Bimla, is grumpy and irritated. Ram seems to be somewhat hot-headed, and his mother tries to soothe the hurt feelings of a pair of fellow passengers (one of whom is Tuntun) by telling them that poor Ram has more than his fair share of worries. Despite being well-educated (mum sold all her jewelry to pay for his education), he hasn’t been able to find employment. And, to make matters worse, they aren’t being able to find a good [read: not greedy] groom for Bimla. The last match they found wanted Rs 5,000. The train journey comes to an abrupt halt at a small railway station [ironically enough, there is little evidence of a platform, though there is a station master’s office]. The passengers spill out of their compartments and arrive at his office in twos and threes. This is where we get to see a glimpse of the cross-sections of society travelling in this train. Ram and his womenfolk are, like the others in their compartment, used to the hardships of life. But there are others—in the first class and other more upmarket compartments—who are a different breed altogether. There is, for instance, a mysterious but imperious young woman (Sheila Ramani) who is obviously used to ordering everybody around. In a very brief scene, we (not her fellow passengers, though) discover that she is a princess. She’s run away from home after her father, the Maharaja of Andher Nagari (Raj Mehra) has arranged her marriage with a man she does not care for. The princess is keeping her identity under wraps, but she can’t help but be a little apprehensive when she discovers that the stalled train is still in Andher Nagari territory. This means that it’s not difficult for her father to haul her back if he finds her. [Though it is somewhat forced, the name ‘Andher Nagari’ for this stretch of land turns out to be, as the film progresses, singularly prophetic. Not because it’s barren or mosquito-infested, but because the rot here is deep and widespread—and starts at the top, with the Maharaja himself]. 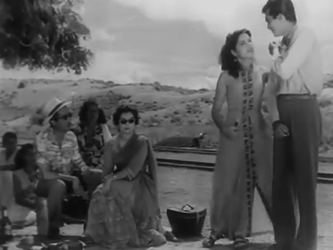 Less imperious than the princess, but also wealthy are a bunch of fashionable urbanites, led by the Kapoors (Mrs Kapoor is played by a young Nishi Kohli), English-speaking, alcohol-guzzling, and wanting to know why the delay, and when they will get to Bombay. One of them says this delay is terrible, because it might make him miss the cricket match between India and the West Indies. Another complains that he’ll miss the wedding of his friend’s dog, for which he’s been invited. What a catastrophe that will be. Amidst all of these, there’s the slimy Sethij, Naseeb Chand (a potbellied Johnny Walker), with a child bride and a general dogsbody named Nihal Chand in tow. Naseeb Chand, like the others, is anxious to know what’s happened. 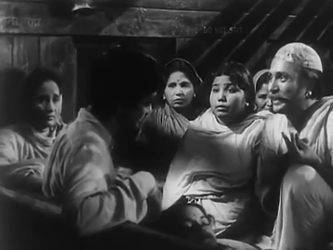 The station master (Nana Palsikar) tells them. It turns out that floods have washed away a bridge further along the railway line. It’ll take at least 24 hours to get the bridge fixed [is this India we’re talking about? I’d think 24 weeks would be a more realistic estimate]. Till then, the train will have to stay here. And the passengers will have to make shift as best as they can. To the flurry of questions that follow, he replies that there isn’t a hotel or guest house around. They can stay on the train. To queries about food and water, he says that about a furlong away, there’s a shop which sells food. Next to it is the shopkeeper’s well. While the others are still busy complaining, Naseeb Chand has sniffed out an opportunity to make money. Along with his man Nihal Chand, he goes off to find the shop. 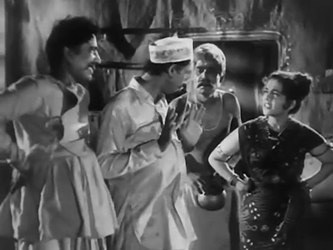 Naseeb Chand has a chat with the shopkeeper and his daughter Naina (Nalini Jaywant) and makes a proposition. He will rent their shop—and the adjoining well—for the next 24 hours. He will pay them Rs 150 for both. This amount is beyond Naina’s comprehension. She can only count up to twenty, so Naseeb Chand has to finally explain to her that he intends to give her ‘seven twenties’ for the shop and well. My! What good fortune! Naina is ecstatic. The money—and the rented property—exchanges hands there and then. And this sets the basis for much of the story. Because Naseeb Chand’s avarice knows no bounds. The next person who arrives at the shop wanting to buy food is quoted an exorbitant price for a couple of puris and sabzi. Naina, going to the well to draw water, finds Naseeb Chand in her path [and, with that paunch of his, he’s pretty good at blocking paths when he sets his mind—and body—to it]. The well has been temporarily sold to him, he reminds Naina; if she wants water, she has to pay for it, like everybody else. Naina is horrified. He’s selling water? How dare he! She tries to fling his money back in Naseeb Chand’s face, but he doesn’t take it—and tells her they had an agreement. She cannot now go back on her word. …with the result that Naina falls head over heels in love with him. She doesn’t tell him so, but the way she follows him about [rather reminiscent of a loyal puppy, and Nalini Jaywant’s huge liquid eyes add to the spaniel effect] makes it obvious. Will Naina get her hero? It looks like it just needs time, and patience on Naina’s part. After all, Ram is indulgent towards her, and doesn’t mind her attention. And Naina (as the philosopher-poet describes her) is a devi. 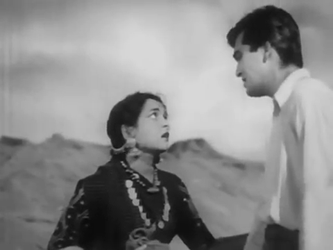 And as any avid watcher of old Hindi films will tell you, it’s the devi who gets the man. But there are obstacles lurking in Naina’s path, not the least of them the very fact that Ram is jobless and (financially speaking) in pretty dire straits. How far will he go to change that situation? And will Naina fit into his plans? The passengers stranded in Andher Nagari soon become divided into two [though not mutually inimical] camps. On the one side are the poor, trying somehow to scrape through this day—or couple of days—of being forced to buy food and water from Naseeb Chand. On the other hand, also buying from Naseeb Chand, are the wealthy. To them, his thievery is irrelevant; they buy their food, and go off on a picnic. Woven into this are other problems. For one, the corruption of Naseeb Chand. For another, the unholy nexus between religion and business—Naseeb Chand is soon in cahoots with the local pandit, promising to donate funds for a temple if the gods will bless his enterprise. The priest, in his turn, is happy to butter up Naseeb Chand, knowing that he will eventually benefit. Then there are the more individual problems: conscience versus need (or conscience versus greed, have it as you will). Selfishness versus generosity. Love versus duty. All time-honoured problems in cinema and literature, and treated here with a (mostly) deft hand. A lot to happen in only about 24 hours, but it does—and it makes for an entertaining just over two hours. The plot, which is coherent, fast-paced, and packs in a lot. 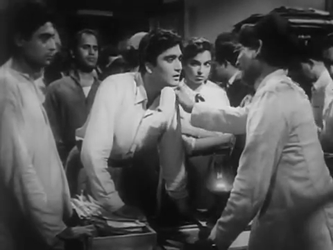 The direction (by Ramesh Saigal, who also wrote the story, screenplay and dialogue for this film). And the fact that the film manages to convey its message(s) without descending into the very depths of misery for its characters. 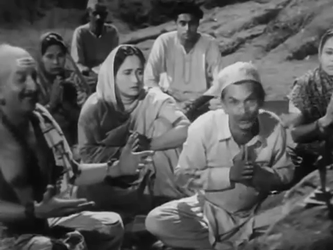 The songs, composed by Madan Mohan and written by Sahir Ludhianvi, are not amongst their best-known, barring possibly Basti-basti parbat-parbat gaata jaaye banjaara. But there’s the interesting parody of a Kavi Pradeep song that was cynical to start off with: Dekh tere insaan ki haalat kya ho gayi, bhagwaan becomes, under Sahir’s atheist and acid pen, Dekh tere bhagwaan ki haalat kya ho gayi, insaan. Another song that pokes fun at the establishment (and uses the setting’s unfortunately appropriate name) is Andher nagari chaupat raja. And, it’s a refreshing change to see a hero who does go down the wrong way—and knowingly. Ram is poor, yet his education makes him different from the illiterate people who surround him. 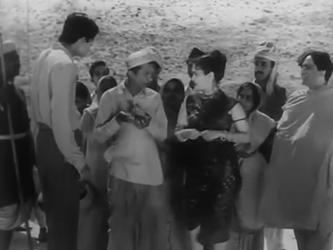 When he tries to associate with the wealthy, however, he cannot really pull it off (in the picnic scene, for example, Ram stumbles and trips over his feet several times while dancing). He is, as the poet dubs him, Trishanku, caught between one and the other, and not totally part of either. What he does to find his middle ground is reprehensible—yet understandable, and therefore more real. The ‘they’ and ‘us’ in Railway Platform are a little too clear-cut. True, some of the main characters—Ram, and the princess in particular—do have some shades of grey, but the others, especially the wealthy, are all the same. All selfish, conceited, frivolous drunks who can only spend their free time dancing and singing and flirting. A sweeping generalization that I couldn’t quite swallow. Still, that’s a minor niggle. When considered against the rest of the film, it’s forgivable. Note: Railway Platform is available on Youtube, here. “Basti-basti parbat-parbat gaata jaaye banjaara” is my favorite song since childhood days! I had a cassette which had songs and bhajans by Mohd Rafi.I particularly liked this song, but was unaware to which film it belonged. Now I come to know that it was composed by Madan Mohan :) .Nalini Jaywant seemed to get unconventional roles which gave her more scope as compared to other actresses of her time. And Johnny Walker playing a corrupt businessman! Does he get reformed? This actually wasn’t that unconventional a role for Nalini Jaywant (it was pretty much how Indian village women are mostly depicted in old films), but I agree with you about her taking on unusual roles – look at Shikast or Kaali Paani, for instance. Not many leading heroines would have done either of those roles, I think. He does, but only after he’s been soundly thrashed. Do watch – it’s a good film. 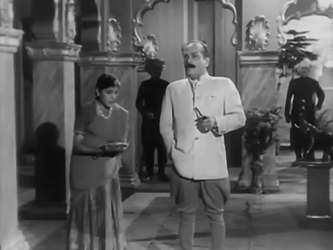 This movie also has the lovely Chand Madham hai Asmaan chup hai. I had no idea the movie was good. I must see it. I believe Chaand madham hai aasmaan chup hai was eventually not included in the film (or was removed, I’ve no idea). It was certainly not there in the Youtube version I watched (so I have you to thank for telling me about it! I didn’t even know it existed). And all the other Youtube videos I’ve come across are basically just the audio files merged with either a series of stills from other films, or with the picturisation of another song of similar mood (one was with Chaand phir niklaa. What a lovely song, though. Thank you for telling me about this, Ava. P.S. And do watch the film – it’s very good. You know something every time I read your posts I get hooked, thanks to your asides. I had heard about this film but had no clue what it was about, but going by your review, I think it is worth taking a look at it. 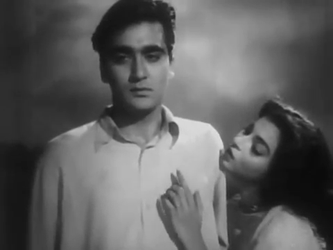 While reading your review something struck me, Sunil Dutt in his debut role saves the heroine and I wondered whether that sort of set the tone for his personal life, he after all ended up saving Nargis and my father. A case of real life imitating reel life, I guess. 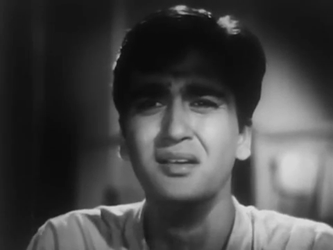 I knew about Sunil Dutt having been a compere for Radio Ceylon and that his real name was Balraj Dutt, but I didn’t know he changed it because of Balraj Sahni – which of course makes perfect sense. Rather like Stewart Granger, whose real name was James Stewart, but ended up having to use a stage name because the James Stewart was already an established actor in Hollywood by the time Stewart Granger began to be credited in films. Is that so? I did know that Stewart Granger was James Stewart, that’s interesting. Yes, James Stewart’s real name was James Maitland Stewart; Stewart Granger’s real name was James Leblanche Stewart. (Though, since Friends is the video company, I would be wary of buying the VCD). Saw this film on youtube last year, and thought it was well made and unusual. Agree with everything you’ve said about it. >[is this India we’re talking about? I’d think 24 weeks would be a more realistic estimate]. andher nagri chaupat raja is my favourite childhood ‘story’. In class 4, I acted as one of the people of this nagri going to fetch water in a seive :-D Don’t remember much. (I may have already mentioned this on another post). Very true! Though, since I’d already experienced Johnny Walker as Parker in Mai Baap, this wasn’t that much of a shock to me. He was equally – if not more – bad in that. Gave me the shivers. Just shows what a fine actor he was. Ah, yes, Pacifist. I remember hearing this song back then when you’d posted it on Harvey’s blog. Good song! It’s interesting that while the film is leftist this story actually shows the negative side of non-discrimination of policies. The story goes on about how a mother of a thief sues a houseowner for having a weak wall. Her son tried to climb over it to get into the house to rob. The wall fell, so did the son, but the wall fell on the son and he died. The owner blamed the builder, he blamed the brickmaker, he blamed the mortar, the supplier accepted it was too thin but blamed the mixer who blamed the mullah who arrived on the scene while he was adding water and thus distracted (in order to greet him) ended up pouring more water than required. So the mulla is called who accepts his fate. He’s to be hanged. The noose is too big for his neck, and keeps slipping right down.. The size is prescribed and cannot be changed….. and so on. Wow. That sounds very interesting! Someone could do a really hard-hitting film based on that. >It’s interesting that while the film is leftist this story actually shows the negative side of non-discrimination of policies. What I meant was the film was perhaps trying ta balance and so tried to show that discrimation is to be intelligently applied. I forget what it was about the use of this saying there. oops! Of course I don’t mean of people. I actually didn’t interpret the film as being a literal interpretation of the original play as you’ve outlined it. To me, it seemed more as if the essence of the phrase ‘Andher nagari, chaupat raja‘ was used, to show that because the raja of Andher Nagari is so money-minded and autocratic and cunning, that is reflected in his kingdom (to some extent). Ironically enough, of course, the chaos in this instance is caused largely by Naseeb Chand, who is actually just a passenger through Andher Nagari. Pacifist, I remember having to study Andher Nagri Chaupat Raja as part of our Hindi. Thanks for refreshing my memory of the play. :) I remember laughing through the class when we were doing the reading; it is only subsequent readings (when I was older) that brought home the satire in the play. Sorry to hear about you and your husband’s illness. Was missing a new post. But honestly I was also concerned. :-) Wishing you both speedy recovery Anu. Yes. Anu. It is one of the best satires that I know of. I just love such idealistic films!!!! 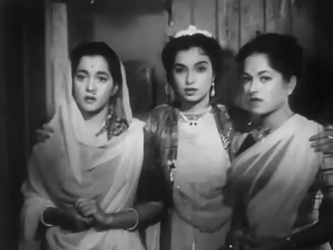 Nalini Jaywant, Sheila Ramani and Sunil Dutt look so damn beautiful! There are rumours that this is also Dharmendra’s debut film. Did you by any chance see him anywhere there? But this one is really good. Do watch – and the idealism is well expressed, tongue-in-cheek and satirical through most of the film. must be one of those mistakes, which go around the blogosphere and turn into rumours. Yes, must be. 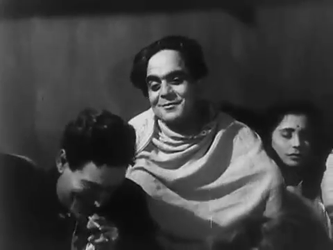 Though this was one of the earlier films of another actor – Jagdeep. He appears in Railway Platform as a wayward teenager who tries to steal the princess’s purse. 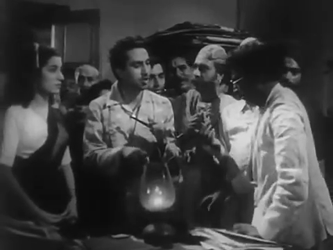 Yes, he also appeared in Guru Dutt’s Aar Paar a year before. 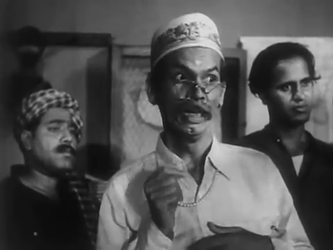 And he was there in Do Bigha Zameen (1953), as a child actor.